RENT TO OWN! Coming Soon in July! $500 MONTHLY CREDITED TOWARDS THE PURCHASE PRICE! Beautiful House at Oliver’s Crossing! This is a beautiful four bed room house located in a family oriented subdivision at Oliver's Crossing in Winston Salem. This house has everything. Hardwood and carpeted floors. The entry opens to the stairway, and Living Room with fire place that leads to the Formal Dining Room. A Den/Family Room off the Kitchen with views to the back yard. The large open Kitchen has all the appliances, hardwood cabinets and a breakfast area that opens to the back yard deck. Other features include a vaulted Master bed/bath with walk in closet, garden tub and stand alone shower. This house includes a two car garage and a private back yard and deck. New heat/air. 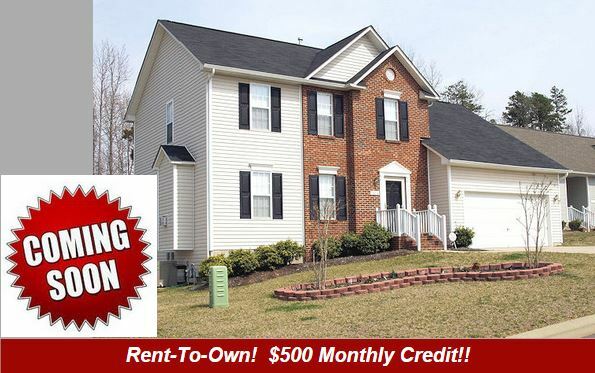 Rent-to-Own one of the Nicest Homes! Nice looking sticks-and-bricks, Steve. You'll move this baby in short order. Super clean advertisement as well and the incentive is very clear. Thanks for sharing this. Also like how your site's content is setup.